We are often asked, “what’s a good app I can use with my child”? There are so many great apps on the market and so many ways we can use them. 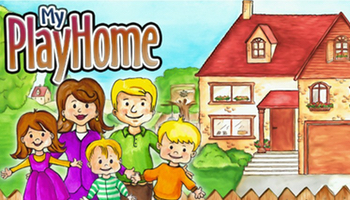 One app we really like is My PlayHome. Name items with your child and discuss the different rooms each item belongs or any smaller categories you come across (e.g., fruits). (e.g., ‘I’m thinking of something that can bounce. It is round. You can throw it and catch it…what is it?’). Ask questions about ‘where’ things should be put (e.g., ‘Should we put the drink on the bench or in the fridge?’). (e.g., ‘Let’s give the boy an apple…I think he will eat the apple…oh wow he is eating the apple…oh no it’s all gone he ate the whole apple’). Take turns to give and receive instructions (e.g., ‘Pour the milk in the cup’). Encourage your child to repeat the instruction- this will also target your child’s recall. Encourage your child to take turns (e.g., ‘my turn’ ‘your turn’). Talk about what each person is doing and model correct pronoun use (e.g., ‘He is eating a sandwich. It is his sandwich. It belongs to him’). Discuss things that might happen (e.g., ‘What would happen if we dropped a cup on the ground at home?’ ‘What would happen if we forgot to water the plants etc?’). Point out potential problems and discuss possible solutions (e.g., ‘oh no.. the boy is wet- what could he do?’). Discuss what the people in the app could say to each other (e.g., ‘Look at that boy jumping on the couch… what would his mum say to him?’). Discuss the emotions the characters might feel (e.g., ‘Oh no… his muffin fell on the ground- how might the boy feel?’). Encourage your child to retell what he/she did ‘first’, ‘next’, and ‘last’. Encourage your child to write about things in the picture- this could be spelling a simple word, sentence, instruction or story. Play a game like ‘I spy’ but, instead of talking about letters, talk about ‘sounds’ (‘I’m thinking of something that starts with the ‘sh’ sound…’). If you have been focussing on your child’s articulation, or fluency, and they are at the level of practicing their sound/‘smooth talking’ in spontaneous speech then this can be a good opportunity for talking about the pictures whilst trying to generalise their skills. The options are seemingly endless and can be used differently depending your child’s age and ability level. Please remember – it is important that you sit with your child and provide lots of modelling to guide their thinking and language development. Without your guidance it can easily become a non-verbal game where there is limited opportunity for interaction or learning. Have fun and let us know about any apps that you are using at home.